When Anti-Monitor is fielded, you may KO a or character die. If you do, move a die from your Used Pile to your Prep Area. Hyperion: Avenger: While Hyperion is active, characters can’t use their “when fielded” effects. Loki: Loki Laufeyson: While Loki is active, once per turn you may pay to deal 1 damage to a character die. That character die loses all of its abilities until end of turn. You may use this ability whenever you could use a Global Ability. Wonder Woman: Daughter of Zeus: While Wonder Woman is active, your opponent's effects on their Villains that activate 'when fielded' deal no damage to you. Batarang: Tool of the Bat: KO a level 1 character. Instead, KO a level 1 or level 2 character. Instead, KO a level 1 or level 2 character and place this die in your Prep Area after using it. Cyborg: Vic Stone: When Cyborg attacks, KO an opposing character that is the same level as Cyborg. When assigned to attack, knock out a character (either player's), then deal damage to your opponent equal to that character's level. Vibranium Shield: Irreplaceable: Place this die touching an opposing character. Opposing characters that match the character's type cannot attack or block until the end of your opponent's next turn. Then place this die in the used pile. Emma Frost: White Queen: When fielded, you may pay to replace an opposing character with a Sidekick from the opponent's used pile. 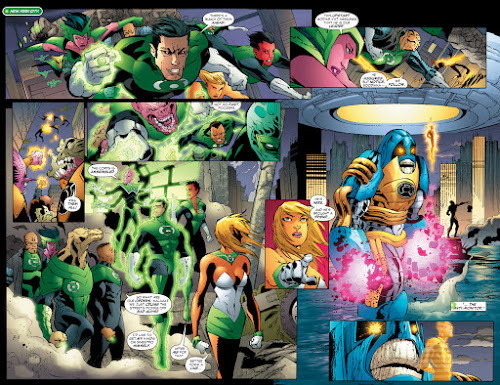 ^ Green Lantern Corps Vol 2006 #17 Page 14. DC Wikia Database. Retrieved 13 November 2016.